Go ahead; wear green and go out get drunk or whatever it is you do this weekend. 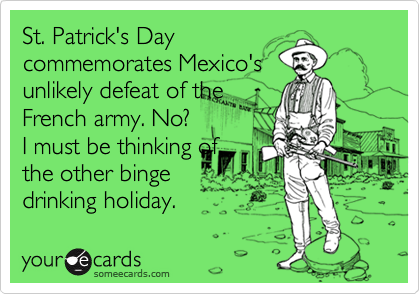 But don’t forget Saint Patrick’s Day is a celebration of the Batallón de San Patricio, which according to Wikipedia my extensive readings of history books, was a unit of hundreds of immigrants and expats who fought as part of the Mexican Army against the United States. Of course for Americans of the generation that fought the Mexican-American War, the San Patricios were considered traitors, while for Mexicans of that generation (and pretty much to this day) the San Patricios were heroes. Now go get some green tequila and Irish tacos. This entry was posted in Awkard homages, Cinco de Mayo, Education, Immigration, Latin America, Literature, Mexico, Politics and tagged Cinco de mayo. Bookmark the permalink. I love the Batallón de San Patricio. Glad to read about it somewhere other than Wikipedia haha.